To use a shortcode, you need to find the slug or ID of the layout template or saved row, column, or module you want to insert. From the WordPress admin panel, click Beaver Builder, then click Templates, Saved Rows, Saved columns, or Saved Modules. 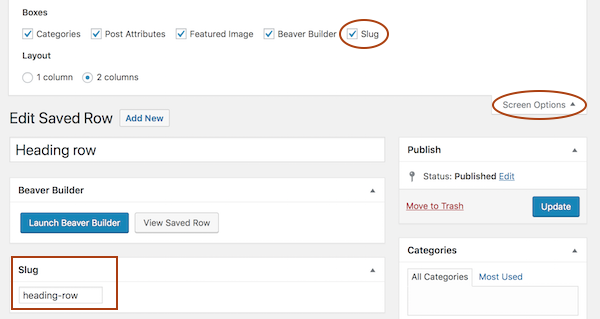 If you don't see Beaver Builder in the WordPress admin panel, enable it by following the instructions in the Related Article below. Click Edit beneath the template, row, column, or module that you want. Do either of the following to get the slug or ID. To get the slug, copy the value in the Slug field, as shown in this screenshot. If you don't see the Slug field, click Screen Options in the upper right corner and select the Slug checkbox. To get the ID, copy the post number from the URL in your browser’s address bar, as shown in this screenshot.